With the new year quickly approaching, I think back to the big "scare" of Y2K when we reached the new millennium and the panic that ensued - people saving water in big jugs? I never understood that. Everyone was preparing for the big crash of all our computers and other high tech stuff and so on and so forth. Does it seem possible that 10 years have passed since that amazing date in history? Were you doing anything special on that New Years Eve? I honestly don't think I was. My usual bill of fare is dinner, jammies and a movie on TV. I fall asleep before the New Year rings in; I figure it's coming in with or without me. 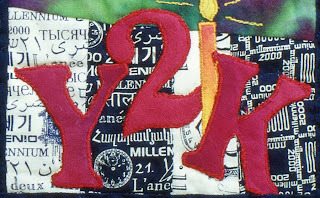 But as I recall, it was just a year before, that I started a journal quilt ending with the last week being Y2K. It was great fun to do and share and always well received at my lectures. My dear friend Barbara Butler and I did this together; each with our own personal blocks and ideas and always ready to share with each other. This is a great project to do with a buddy or a group. My finished quilt featured 13 blocks down and 4 rows across - a total of 52 blocks (and weeks in a year), how perfect! Each block was 6" wide x 4" high including seam allowances and the sashing strips were 2" wide including seam allowances. Each week I created a block to feature something significant for that week. I then created it in fabric, sewed, painted and embellished. Some weeks I was traveling a lot and didn't get to doing a block. I'ld let it go, wrote down the idea and got to it when I got to it. So here are some of the blocks. This particular week I was redecorating a room, painting, etc. I remember this next week so well. My daughter had just graduated from college and we did a road trip to NY city. The tree is the big tree in Rockefeller Center and the small gold "coin" is a subway token; you use them a lot in NY. I've taught in Toronto, Canada a lot and on one of my trips, my good friend Sherry Davidson took me to the "Shoe Museum". Yes there is such a thing in Toronto and it's wonderful! It's a must see if you,re ever there. 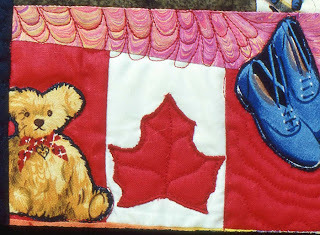 Sherry also collects teddy bears, has over 300 in her collection and the Maple leaf is for the Canadian flag. The next block is very dear to me. My mother in law loved to go to lunch and each time she would visit, we did that a lot! One place we loved in downtown Atlanta, served the biggest sandwiches, you could hardly get your mouth around it. So here is that sandwich. 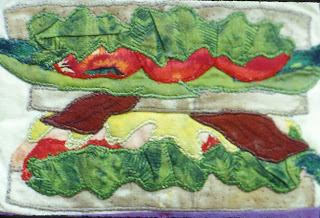 The lettuce is green "crinkled" textured fabric. This next block is funny and also very helpful. Apparently one year, I scheduled all my appointments for the same week. Yes - the gruesome ones. The first section is the dentist, the middle is a pap smear, mind you, I don't look at the instruments; this is totally from my imagination! The last section is a mamogram. I used to go to a doctor for a breast examination - that's all he did, all day long. My mother died of breast cancer, so this was an important thing for me to do twice a year. One time he asked if I had remembered to have a mamogram. I thought a second and replied with the utmost of certainty YES!, it's in my quilt! So there you go. More blocks to follow very soon, so stay tuned and thanks for visiting with me. AND.....HAPPY NEW YEAR!! A week and a half later and the snow is still with us. I'm not complaining mind you, just unusual for NC. 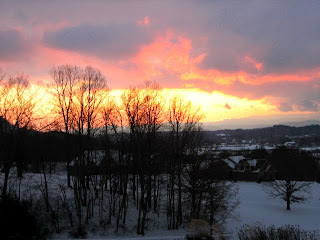 We've had some beautiful sunsets this past week that would take your breath away. These are all from my back deck - enjoy! This was another evening when my husband ran out and snapped real fast. You know how quickly the sky can change. It almost looks like a painted backdrop for something. Hope you're enjoying this wonderful season and getting to spend it with your loved ones! We are stranded! The snow came in fast and furious on Friday, beautiful to watch and we were thankful we didn't have anywhere to be. I'm hearing lots of "snow stories" about being stranded, no electricity, luckily we have power, food and fabric. What more could a quilter ask for. This is Molly's first snow and we had to see her reaction - not her favorite thing! And it just kept on coming, it didn't want to stop! It was a winter wonderland. This is the front and a steep driveway so guess we're not going anywhere anytime soon. We have a big barn near us that boards horses; the dark horses against the white snow was so pretty. Hope you're all staying safe and warm. I think I can say with the utmost of confidence that this is the first, last and only time I'll drink something that cost more than my electric bill. 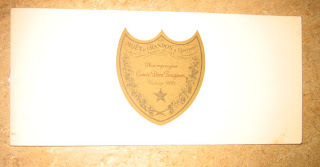 But the story of our bottle of Dom Perignon goes back a few years. 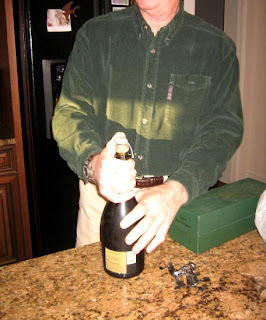 My husband was an FBI agent and his last case was a big one - the Gold Club which took place in Atlanta. 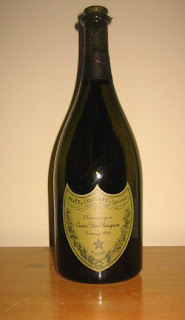 There was a lot of illegal stuff going on with this club including the use of Dom Perignon (club was closed down as a result of this case) but back on track, as part of his retirement present, he received a bottle of it - how appropriate. After learning the price, we decided we needed a good reason to open it. It came in its own box, so easy to store in the refrigerator. Our first thought was to open it when we moved to Asheville - a celebration. The trouble was, we were so exhausted after the move, we plum forgot we had it. So okay, we waited for the next really special occasion which was the move to our house and once again, we were so tired, fell asleep and didn't remember we had it. SO HOW LONG IS THIS TO GO ON? Well this year, my sweet daughter got engaged to a great guy, so NOW was the time to celebrate! And we did and WE DIDN'T FALL ASLEEP! And the opening - TA-DAAAAA. We held our glasses close by so's not to lose any. The box it came in which was stored for years in our refrigerator; I was almost afraid of what it might taste like after all that time. But very yummy, mind you, I'm used to wine that doesn't even use a cork so this was a major step up for me. And it even comes with a certificate and story. And here's to the happy couple; what a great way to ease into 2010. From time to time, I like to showcase some of my favorite artists. 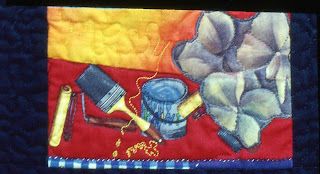 Today I'ld like to introduce you to Val McGaughey - a fiber artist from Asheville, NC. She is enormously talented and one of my favorites for so many reasons. She works in silks, cottons and anything that strikes her fancy. She also incorporates many surface design techniques giving great dimension to her work. 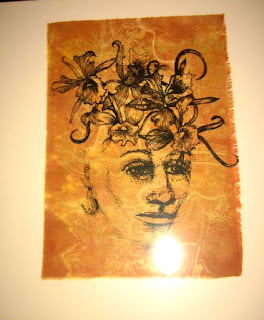 I love her imagery - it's quite wonderful and she creates it herself as you can see in the silk scarf below. 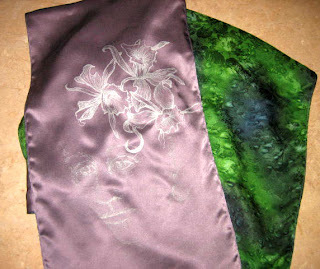 I love this beautiful double sided silk charmeuse scarf and the use of 2 colors together - it's very dramatic. I also love the imagery on the purple area. Val likes faces and so do I, so I was drawn to this. 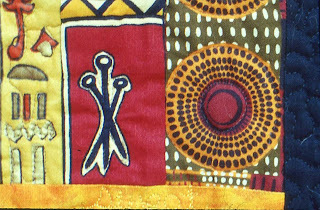 Val dyes her own fabrics and makes her own screens using her hand-drawn imagery. She'll often combine 2 or 3 screens on one piece to get the effect she wants - like in the piece below. 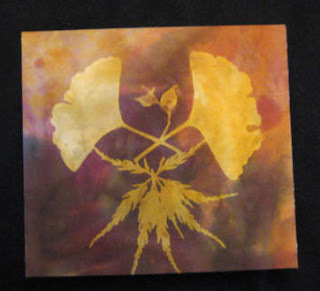 Val also discharges images by using a discharge paste through one of her screens like in the piece below. The next two pieces uses my favorite screen. the image of a piece of cheesecloth or gauze burned onto the screen - so interesting. You can really see the patterning of cheesecloth. 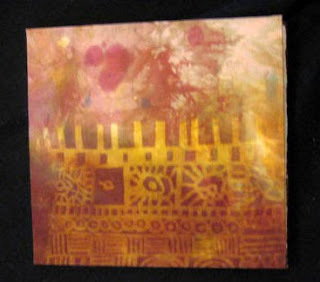 This next piece is a book-cover made with hand-dyed fabric and discharged images on top. And this fabulous piece - made wider to be used as a shawl or very dramatic scarf. 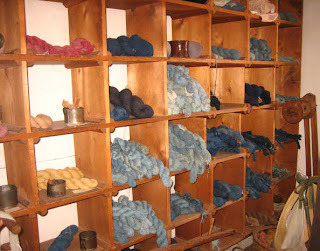 All the silk was hand-dyed, screened, and discharged. Val achieves great depth to her work because of all the processes she incorporates in each piece. Val is a fiber artist "extraordinaire". I am delighted to own some of her work and also to call her my friend. Okay, as I was posting I accidentally hit the delete button and this picture was eliminated and I hate for you to miss us in one of our Finest Moments so I had to post it. We are holding our presents. See previous post for a recap of the day. Well, maybe not - especially if it's just too funny not to share. 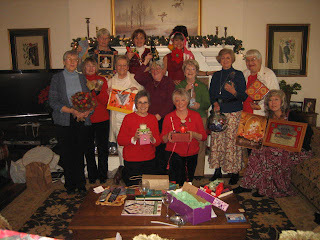 Our fiber group PTA met for our annual Christmas party. 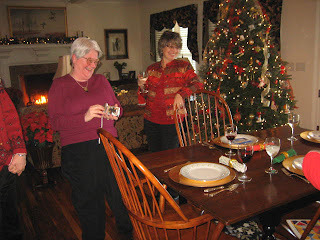 Great food, goofy gifts and endless laughs are a trademark for this event. Everyone brings their favorite dish to share, making it easy for the hostess (this time it was me). Lots of wine and good conversation. After lunch we have a "show and tell". 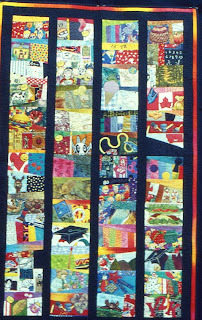 Barbara Swinea brought this quilt to share. She is backing the quilt with fleece and no batting - so just the 2 layers. 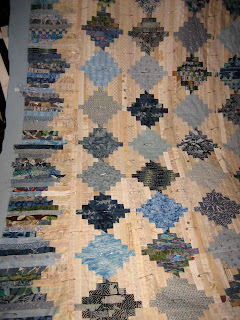 I really loved this idea, makes a great lap quilt. Barbara is our "master piecer". 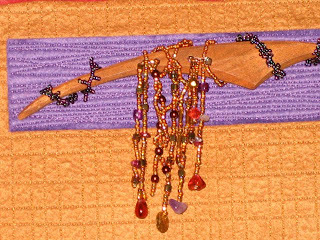 Mary Stori's newest piece - the beading is lovely on this as you can see in the detail. Dort Lee makes a lot of her Christmas presents. 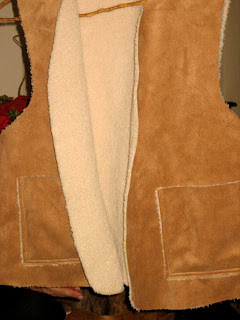 Dort made this out of a synthetic suede with fleece lining. I WANT some of this fabric! How warm and cozy looking is this! 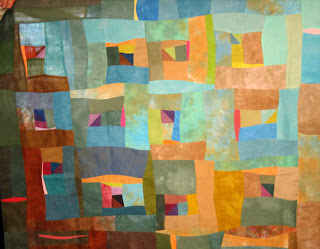 Lynne Harrill made this next piece out of leftovers of a previous quilt - great job Lynn! Okay, now onto the "sillies". We do a White Elephant gift exchange. Wrap up whatever, put in pile, pick a number and when your number is called you get to pick from the pile of "whatevers". Sometimes they're good and sometimes not, but they always make us laugh or smile. 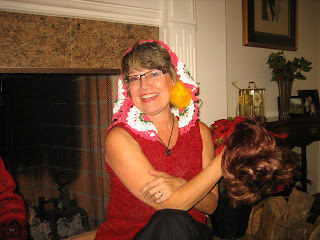 Janice picked this huge bag of goodies which included fleece pointsettias, a wig, a crocheted something and candles. This bottle cover with zipper was "cute". The next person who shall remain nameless picked some giant pom-poms; what a clever way to use them. Who woulda thought? And the "pom-pom" person (as she shall be known as from here on), also picked this gorgeous bunch of flowers. She liked them! 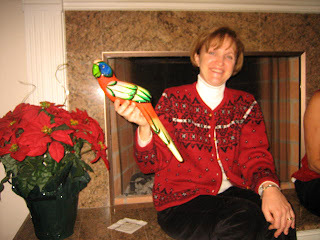 Poor Kate got the infamous "bird" - a ceramic bird that has been circulating around for years. I think it's our mascot or something. I was just so thankful I saw her remove it from my house. I had some fears she might hide it somewhere and I would never be the wiser. Mary got this vase or urn, something that hangs on the wall. Are those "tears of joy" I see on Mary? And remember the wig Janice picked earlier, Cathy took it from Janice. It seems her little girl really wanted a wig for playing dress-up - so a preview of what it will look like. And here we are - what a crazy, talented, fun to be with bunch of ladies, I love them all! Last week, my husband John and I went to Old Salem, NC, a smaller version of Colonial Williamsburg and a trip we've wanted to do for some time. We like seeing how towns were decorated for Christmas a century or so ago. 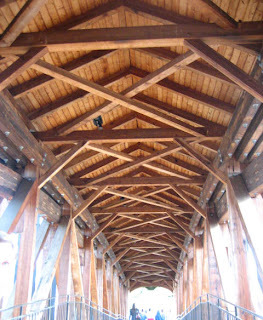 It was a beautiful day and upon entering the village, we had to go through an old bridge with a wonderful ceiling. I loved the lampposts with real greenery wrapped around. Decorating was very limited back in the 18th century. 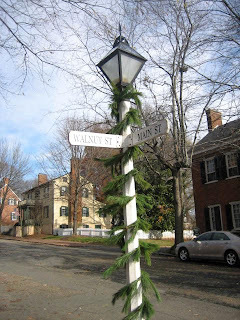 In Old Salem, you have a choice of days to visit - one day is the 18th century and one is the 19th. Certain buildings will be open accordingly. We were in the 18th century when Christmas trees had not come into their own yet; had we come the following day, we would have seen a building decorated more like we do today. 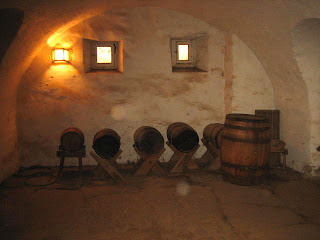 Loved this old celler used for storage and loved the rust stains on the walls. I was most fascinated by the textiles. We went to a tailors shop where everything was made by hand - hard to imagine. Measurements were taken using long pieces of paper with notches punched into them for sleeve length, waist measurement etc. Such an interesting prelude to the tape measure. 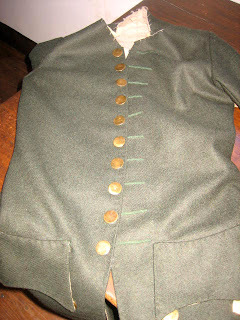 This waistcoat used buttons and the buttonholes were mock ones. Closures used were hook and eyes. 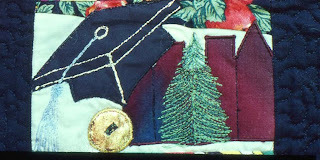 I was surprised to see that stitching was not finely done but crude and unattractive. 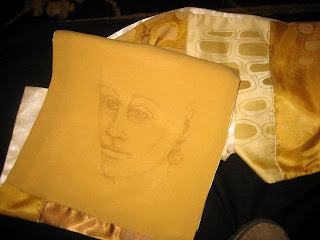 They used silk fabric to line those areas that showed and linen everywhere else. 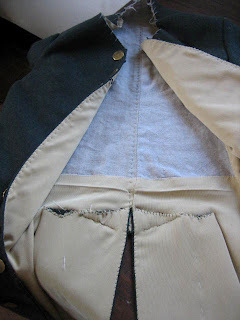 Silk, being a more expensive fiber, was used for "show" such as the sides of this jacket that might flap open and be seen(whitish area). The back, never to be seen is linen. 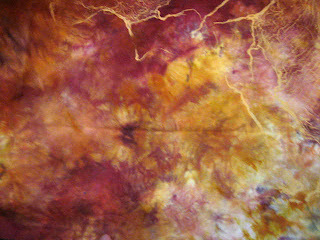 I was most fascinated by the fabric dyeing which used natural dyes. Below is Indigo which is mouthwatering gorgeous! 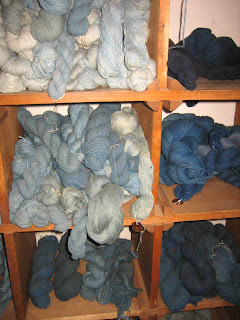 Different values of Indigo can be achieved by numerous dippings - the more you dip, the deeper the value. WOW! They are so yummy! 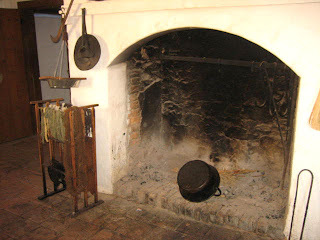 This is the kind of fireplace used to dye fabrics in large pots over open flames. 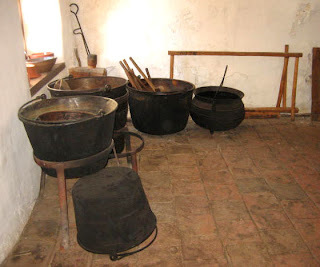 And the pots, I don't think I've ever seen pots that large anywhere except used in olden days. I was fascinated by this next dye pot which was permanently built into a cement structure. I wonder how the excess dye solution was removed. It was an interesting day. 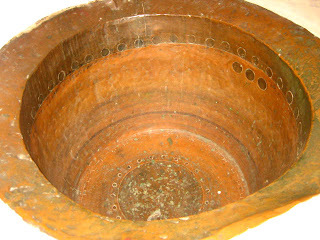 I've often thought how simple life was back then and in a way it was but then I remember how they had to wash clothes and make their own soap before doing so, and make their own bread and spin their own yarn before weaving it into cloth - etc! Guess, not so simple.